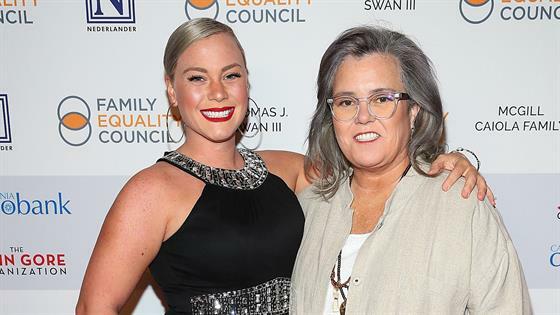 Rosie O'Donnell is officially engaged to girlfriend Elizabeth Rooney, E! News can confirm. The comedian made the announcement on Monday in an interview with People, however, she said they decided it's best for the wedding to be "a long time in the future." At the moment, Rosie and Elizabeth are in a long-distance relationship, with Rooney living in Boston and Rosie living with daughter Dax in New York. And Rosie said Elizabeth does not seem to mind the 23 year age difference one bit. "I keep telling her I'm too old for her. But she doesn't seem to care... She's like, ‘I was in the Army! I put my life on the line every day you think I don't know who I want to date?' I'm like, ‘Alright I guess that's true'," Rosie told People. Prior to her relationship with Elizabeth, the comedian was married to Michelle Rounds, who died in Sept. 2017 of suicide. The pair divorced in 2015, but in a statement, Rosie said, "I am saddened to hear about this terrible tragedy. Mental illness is a very serious issue affecting many families. My thoughts and prayers go out to Michelle's family, her wife and their child." During their relationship, the two adopted their daughter, Dakota, who now goes by Dax and lives with O'Donnell in New York.